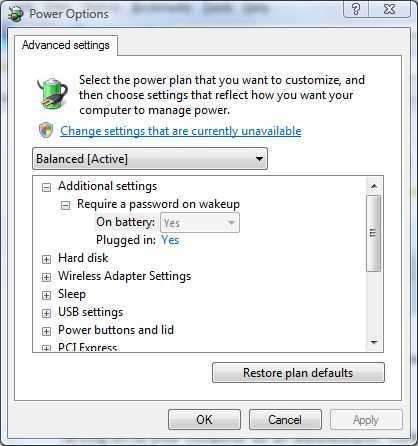 Whenever desktop or notebook computer wakes up from sleep, standby or hibernation state (which also happens when user closes laptop’s lid, unless specifically disable sleep on lid closing), the system is locked up on log on screen, and system requests and asks for user’s password in order to unlock the PC and shows the desktop again. Locking down PC when system goes into sleep or standby or hibernate is a good security measure. As the logged on user is away physically from the PC, requesting and asking the logged in user’s password or administrator’s password to unlock the computer desktop prevents by strangers, hackers, or anyone who passes by. However, it also presents genuine issues for legitimate usage. For example, for standalone home PC, re-entering password is simply annoying and troublesome. In company where no sensitive information is handling, another user cannot use and logon to the locked computer without risk breaking signed in session of existing user, forcing him or her to lose all unsaved works. So perhaps it’s good to make Windows system no longer requests for password on resume or wake up from standby or sleep mode. It’s easy to disable option to prompt for password when computer resumes or wakes up from stand by. Log on to your computer as an administrator. Click on Start, go to Control Panel -> System and Maintenance -> Power Options. Click on Change plan settings for the currently active plan. Click on Change settings that are not currently available link. Give permission to continue when User Account Control dialog pops up. 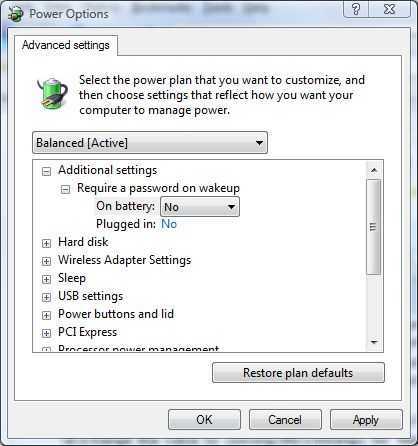 In the “Power Options” dialog box’s “Advanced Settings” tab for the active power plan, expand Additional settings. Expand Request a password on wakeup. Change the value to No for “Request a password on wakeup” by selecting a new option from drop down menu for both On battery and Plugged in. Log on to your computer as an administrator. Click Start, and then click Control Panel. Under “Options” section, uncheck the check box for Prompt for password when computer resume from standby opton. After re-configuration, Windows won’t prompt and ask user to input a correct password on resume or wake up from sleep or standby state anymore. In Windows 10, the option to stop Windows from requiring sign in again is located elsewhere.